Sonya Gavankar is director of public relations and serves as the face of the Newseum by hosting live interview programs and appearing in video installations, video blogs and game shows. She brings a cohesive voice to the Newseum’s 250,000 square feet of exhibits and interactive programming. 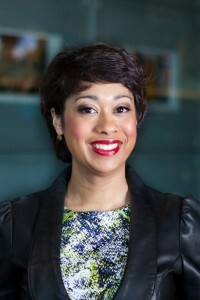 In this role and beyond, Gavankar is a communicator who uses dynamic storytelling techniques and pop culture literacy as a spokesperson, television and podcast host, filmmaker, and Web 2.0 multimedia content creator. In addition to her work at the Newseum, she is an award-winning television personality who can be seen hosting programs on ABC and CBS affiliates, PBS, and even the Puppy Bowl. Gavankar serves on several national boards that focus on education and social change, including the Hugh O’Brian Foundation, The Miss America Organization and Ladies America, and is one of the creators behind HerExchange.com.